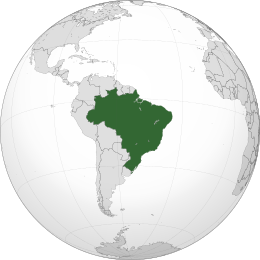 Brazil is a country located in South America. In 1500, Pedro Álvares Cabral, a Portuguese sailor who was heading to India for trading purposes, missed his route and berthed in the Brazilian coast. In that year, Portugal claimed the territory as a colony, aiming to find some kind of wealth, which led the territory to its commercial fate. The land was explored by the settlers for extracting brazilwood, planting sugar cane and mining gold, silver and diamonds until the year of 1816, when it was promoted to a constituent kingdom of United Kingdom of Portugal, Brazil, and the Algarves. In September the 7th of 1822, Dom Pedro I proclaimed independence, creating the Brazilian Empire, which lasted until 1889, when it became a republic, that still remains to this day. Over the first half of the 16th century, Portugal neglected the territory, so the first currency just arrived in 1580. By that time, Portugal was under the Spanish domains, due to the Iberian Union, which brought the Spanish Reales to the colony. The first coins done in the colony were the Dutch Guilder, minted on gold pieces, whilst the Dutch ruled the northeast territory. As the Dutch were expelled in 1654, the Portuguese crown, now independent from Spain, introduced the Portuguese Real. The first Brazilian mint house was only created in 1694. The Real was the official currency from 1654 to 1818, when the Rio de Janeiro mint house made the first coins of the state of Brazil. In 1822, first year of the Empire, one of Brazil's most important coin was minted: The Coronation Piece. It represented the beginning of the Brazilian Real era, which remained until 1942. The imperial Réis were minted in copper, bronze, copper-nickel, silver and gold, generally carrying the emperor's effigy or the empire's coat. Since the proclamation of the republic in 1889, the currency passed through several changes (not only on their design). The first republican Réis had the bust of the liberty or the new coat of arms, replacing the imperial symbols. Due to a fascist revolutionary movement, the Réis gave place to the Cruzeiro in 1942. 1994: a huge push to beat the inflation results on the Real, which lasts until today.